How can mankind make the transition from using the Traditional Mind to embracing the Organic Mind, without losing the wonderful creative qualities we have developed over many centuries? This is a question asked by Michael Morel in his book The Organic Mind. His desired outcome is that of a society in which we are all equal and have ample opportunity to use our creative energy to develop a peaceful earth free from wars, sickness and poverty. Michael presents a refreshing yet realistic look at the way our mind controls our lives and its outcomes. He speaks with truth and honesty and shows us how using our 'Organic Mind' can turn our lives around for the better. He doesn't confess to being right or wrong but uses his personal life experiences to talk of his discoveries, providing a thought provoking read. In Chapter One Michael talks of the the Traditional Mind versus the Organic Mind. He refers to the Traditional Mind being that of a mind that is not free. A mind that is confined by boundaries, rules, regulations and laws. The Organic Mind is that of the total opposite, one that is totally free and guided only by universal wisdom. The Organic Mind by Michael Morel offers food for the mind. It inspires, evokes and empowers. It leaves one feeling that freedom is on your doorstep and within the grasp of your thought processes. Within The Organic Mind Michael speaks of the common denominators within all of us. “ All manifestations beginning with an idea, a silent thought or a spoken word.” We are told this time and time again through many writings but within The Organic Mind Michael Morel is able to put the pieces together, making sense and providing information that one can relate to and recall as required. How often have we imagined a world where negative words have been eliminated and the void spaces filled with positive. Michael Morel address's just this possibility in chapter 1 page 35. Although this may seem impossible Michael looks at how, over three generations, we could achieve just this. The process he proposes is that of common sense and one that is right in front of our noses. It starts in our education system and our religion. “ Retain that which is of benefit and delete that which is detrimental,” writes Michael Morel. The Organic Mind talks of the seeds ( ideas) of our mind being like that of a plant. When planted within our mind some may take a few weeks to germinate before coming to a point where they can be harvested, where others may take years. Michael speaks of the seeds we plant knowing what to do and how to grow and bear fruit. It is what we label reality, that stops an idea growing, this being doubt, impatience, fear or lack of faith. Michael suggests that the Organic Mind knows exactly what to do and has provided the perfect plan for you, the individual. All one has to do is follow it without interference of thought. This is what Michael calls being on autopilot and what those who use the Traditional Mind may call being irrational, carefree and irresponsible. I loved Michael Morels way of looking at life and our journey on earth. There was never a time I felt I could not achieve the Organic Mind and was halfway there by the end of the book. I wrote this review around a month after reading the book and found the journey of rereading and skimming the pages a refreshing reminder of where I go wrong on days I struggle to push the Traditional Mind to the back bench. The Organic Mind provides information that changes the lives of your whole family. By embracing your own Organic Mind your interactions with loved ones and society as a whole leaves a positive experience. We are able to pay our mind thoughts forward to others who in return will pass it on. With The Organic Mind by Michael Morel on my bookshelf I am positive that I will continue to travel forward with my quest to reach this state of mind. 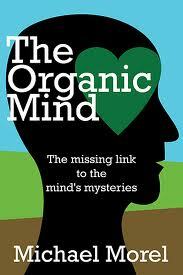 The Organic Mind is more than just a book, it is a resource that you will come back to time and time again. Within is the ticket to a life of less stress, worry and doubt. A life that has you enjoying who you are, those around you and the journey you are taking. To quote Michael Morel “ The bow is the mind and words are the answers, and just as arrows can wound and destroy, so too can words” Through The Organic Mind I have been empowered to use my natural state of mind, my Organic Mind, and destroy those arrows for good. “ The greatest gift a young person can receive today is not a new computer, mobile or car, but the gift of confidence and the information required to allow them to be totally self-responsible. Children today appear to grow up more quickly than when I was a child in the 1930s, and yet and emotion, a thought or an action is the same as it has ever been.” ~ Michael Morel. Labels: The Organic Mind. The missing link to the minds mysteries by Michael Morel.